Blitz is a 2011 British crime thriller film directed by Elliott Lester, starring Jason Statham, Paddy Considine, Aidan Gillen and David Morrissey. The film was released in the United Kingdom on 20 May 2011. The film is based on the novel of the same name by Ken Bruen, which features his recurring characters Detective Sergeant Tom Brant and Chief Inspector James Roberts. A serial killer is targeting police officers in South East London. After two police constables are shot dead and Chief Inspector Bruce Roberts (Mark Rylance) is bludgeoned to death, the hunt for the killer's identity begins. Sergeant Porter Nash (Paddy Considine) is transferred to the South East London branch of the police to head the investigation, even though Nash is an outsider and widely ridiculed by his fellow officers for being openly gay. To his surprise he finds an unlikely ally in the hot-headed, gruff Detective Sergeant Tom Brant (Jason Statham), who has a history of violent incidents. While the investigation is ongoing, PC Elizabeth Falls (Zawe Ashton) is visited by a friend, a young gang member nicknamed Metal, who is afraid his gang might have actually killed someone. Promising him to look into the situation, Falls contacts Detective Inspector Craig Stokes (Luke Evans (actor) ), who agrees to help if Falls goes on a date with him. One of Brant's informants, Radnor (Ned Dennehy), points Brant and Nash towards a man named Barry Weiss (Aidan Gillen) who recently bragged about setting a police dog on fire, "for practice". Although Brant and Nash visit Weiss' flat, they cannot immediately find any evidence against him. Brant does recognize Weiss as the man he beat up in a fight in a billiard hall a year earlier. Unknown to either of them, Radnor decides to conduct an investigation of his own and eventually discovers the seemingly abandoned car where Weiss keeps the trophies of his kills, confirming that Weiss is the killer. Meanwhile, Weiss contacts a newspaper reporter, Harold Dunlop (David Morrissey), to make sure his murders get enough coverage in the press. Weiss promises to keep Dunlop updated about his murders and declares he wishes to be known as Blitz. Soon after, Dunlop is also contacted by Radnor who is interested in selling his information for a high price. Although Radnor leads Dunlop to Weiss' car, he is killed by Weiss before he can disclose Weiss' name. Dunlop then alerts the police to the car, but they find it empty. Brant and a fellow police constable come to realize that all of Blitz's victims so far have been police officers who have arrested Weiss in the past and that PC Falls is most likely the next victim. Falls, after coming home from her date with Stokes, is attacked by Weiss but saved by Metal, who is killed in the ensuing struggle. Before Weiss can attack Falls again, the police arrive. Brant and Nash decide to release a picture of Weiss to the media to flush him out, which eventually, after a lengthy chase, leads to Weiss' capture. There is no concrete evidence against Weiss however, so after 48 hours and an interrogation which does not yield results, the police are forced to let Weiss go. Exasperated, Brant and Nash devise a plot to trick Weiss, knowing that Weiss will want to take revenge on Brant for the billiard hall fight. Weiss infiltrates the funeral of Chief Inspector Roberts, dressed in Roberts' uniform which he had stolen after murdering him. During the service, Brant leaves, followed by Weiss. Brant leads Weiss to the top of a parking garage, only to reveal that Brant and Nash had switched places along the route. Surprised by a hidden Brant, Weiss is mercilessly beaten, overpowered and relieved of his gun. Explaining that they will never find enough evidence to convict Weiss legally, Brant concludes that they are now in a convenient situation: since Weiss is dressed as a police officer, and Brant has Blitz's gun, they can shoot him with his own gun, and it will look as if Weiss was just another of Blitz's victims. The film's script was written by Nathan Parker. The film was shot in London in August 2010. 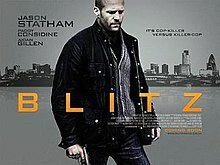 Blitz was the first film produced by Lionsgate UK. Blitz received mixed reviews from critics. On Rotten Tomatoes, there is a 48% approval of ratings by critics and a 36% approval rating from audiences. ^ "Blitz review on Rotten Tomatoes". Rotten Tomatoes. Retrieved 17 October 2012. ^ "Blitz (2011)". Box Office Mojo. Retrieved 11 June 2011. This page was last edited on 27 February 2019, at 17:58 (UTC).